Kind of a chill day. My wife took the older kid to the beach with a family friend. I took the younger one on some errands then to the pool for a few hours. I did get up pretty early as I knew I needed to finish my other post before the real day began--surely you've already read the one where I told all of you that Garrett Oliver will be doing an event at my local Total Wine. So I'm talked out, except that I did include a link to the book Garrett is promoting below if you are interested in reading it. If you are going to make the event, take it for an autograph too! 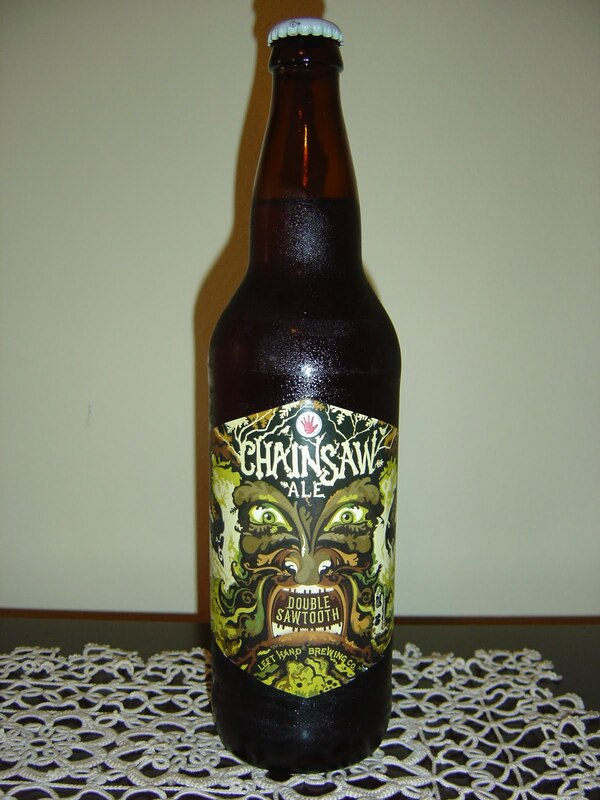 This afternoon I'm drinking Chainsaw Ale brewed by Left Hand Brewing Company in Longmont, Colorado. 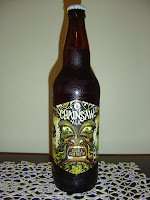 The label says "DOUBLE SAWTOOTH" as this beer is "a connoisseur version of [their] award-winning Sawtooth Ale, designed to befuddle silly generalizations about life". Hmmm. OK. I've never had Sawtooth, but we'll see! On the label designed by Moxie Sozo with artist Charles Bloom is what appears to be a scary camouflaged woodsman Uni-bomber type. You know, like Jason finally dropped the hockey mask and decided to do his thing incognito. Bottle Conditioned In 29 10. Another hmmm. The two and nine are almost on top of each other so I doubt it's 2 9 10 but maybe. Well at least I am 99.9% sure the 10 is for 2010, so it's new. Fruity ripe pear and apple aroma with lots of booze. Holy Cow! Very alcoholic and spicy. Thick syrupy fruity alcohol not challenged by anything. Hints of fruits and apple are buried underneath that from start to finish, from cold beer to warm beer (it took me excruciatingly long to drink all 22 ounces). Very weak carbonation, almost flat, made the bad experience worse. Bourbon (almost) shiver. On the lightly bitter side I guess. I forced myself to drink this and didn't like it one bit! Worst $9 I spent all April! Don't buy this or even drink it for free! The Ferm and I drank this at Charm City Burgers and didn't like it at all either. I would not recommend it. Hi there. Biggest disappointment (beer-wise) the entire month! Left Hand is a solid brewery, too. The bottle looked good, the artwork was cool, but the beer... well, you read what I thought.